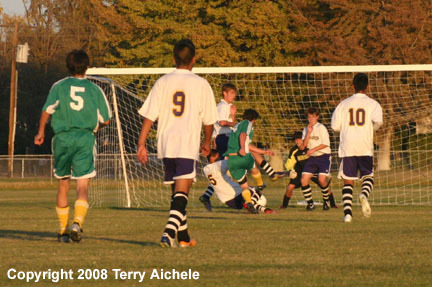 Pendleton scores just seconds before the final whistle blows. 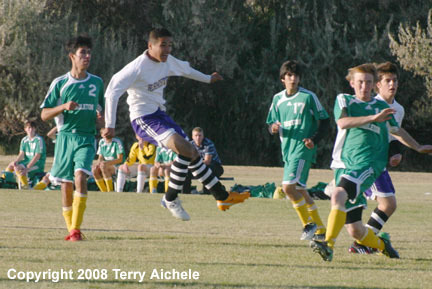 Hermiston had played Pendleton to the 80th minute tied 0-0. 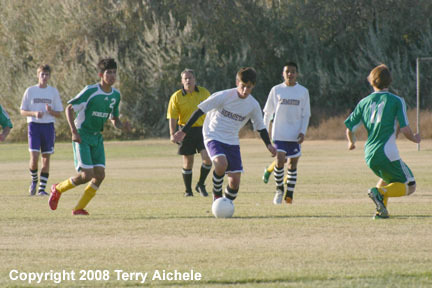 HERMISTON - The Hermiston Bulldogs hosted the Pendleton Bucks on Tuesday, October 23 in a conference soccer match. Pendleton won in the closing seconds of the second half with a angled shot from the left side of the Hermiston goal for a 1-0 win. The match had been a hard fought physical game throughout the 80 minutes. The first half started off physically with Hermiston putting pressure on the Pendleton goalie. 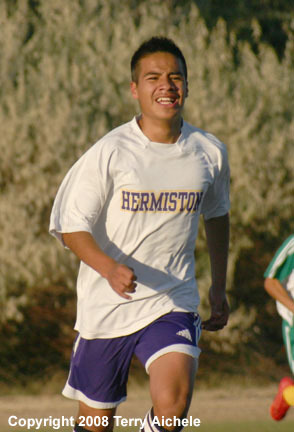 Over the course of the first half Hermiston took four shots on goal to Pendleton's two shots. Two Bucks went down after colliding with teammates. The second half continued the physical play. Three minutes into the second half a Hermiston player got tangled up with a Pendleton player on the south sideline about 10 meters from the corner. 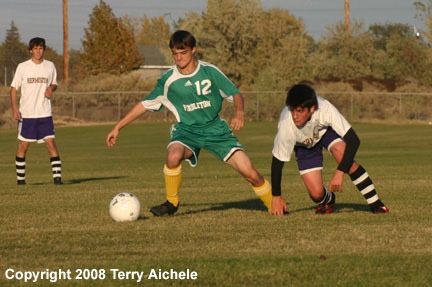 When the two players came up the referee separated them and gave a red card to the Hermiston player. After sending the Bulldog to the bench the referee gave a red card to the Pendleton player and sent him out of the game. The Bucks seemed to pick up the pace at that point. 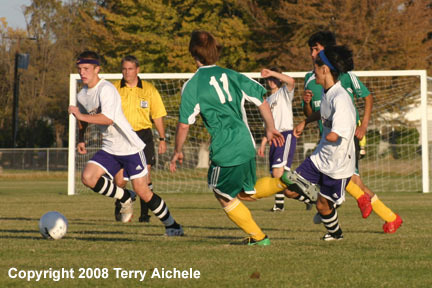 Over the course of the second half Pendleton missed four shots on goal while Hermiston only took two shots. Late in the second half, at about the 39th minute a Buck was given a yellow card. Hermiston lost possession to the Bucks who drove to the left of the goal and kicked a crossing shot that was buried deep into the back right corner of the goal. The Bucks celebrated the goal and as Hermiston dusted themselves off and started to move to put the ball into play the final whistle blew, ending the game with a Pendleton 1-0 win. LEFT - A Hermiston mid-fielder makes his way into the Buck zone. 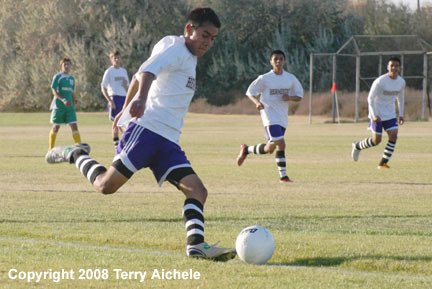 RIGHT - A Hermiston player takes a shot from the left side of the goal during the first half of the game. 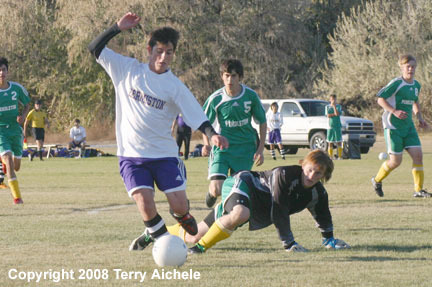 LEFT - The Pendleton goalie comes out to challenge a Hermiston forward. 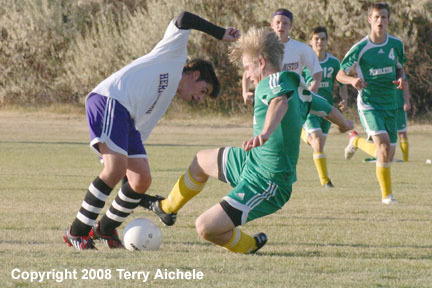 RIGHT - A Hermiston player collides with a Pendleton defender. 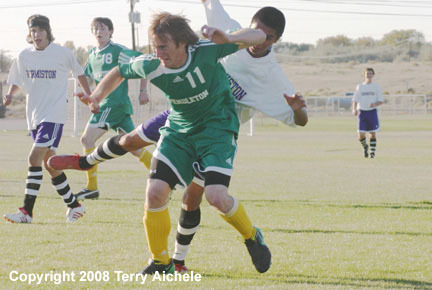 LEFT - A Pendleton defender uses his body to block a Hermiston forward. RIGHT - Hermiston brings the ball into the Pendleton zone. 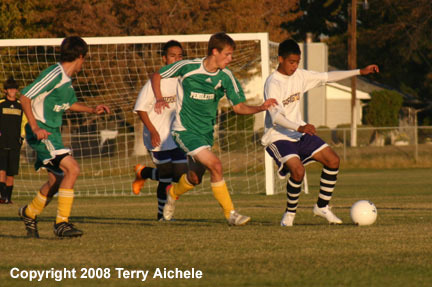 LEFT - A Hermiston forward follows the ball in the Pendleton zone. 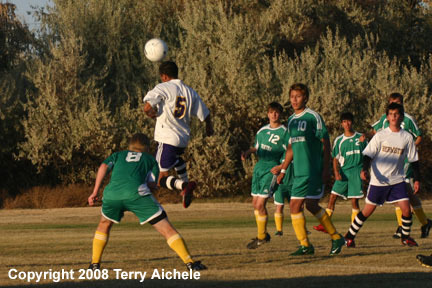 RIGHT - A Hermiston player with a header. 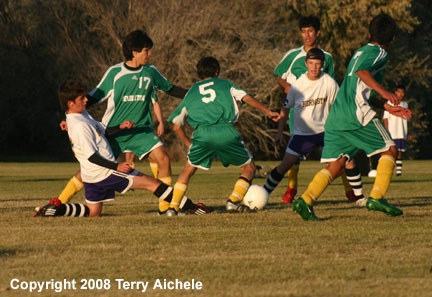 LEFT - Players from Pendleton and Hermiston battle for the ball in the Dawgs zone. RIGHT - A Bulldog tries to pass the ball through a bunch of Bucks. 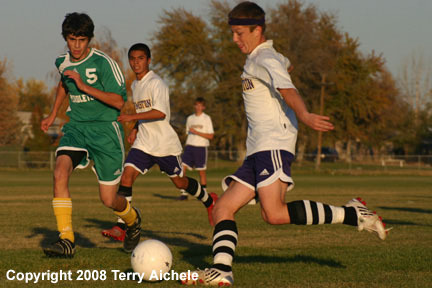 LEFT - A Hermiston player attempts a crossing pass. 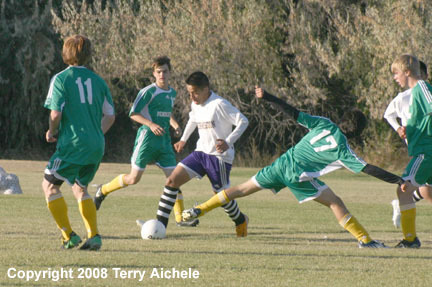 RIGHT - A Pendteton player tries to clear the ball out of their zone. In this sequence of photos a Bulldog and Buck get tangled up on the south sideline just about three minutes into the second half. As they get up the referee steps between them and gives the Bulldog a red card. Moments later the Buck is also given a red card and both players are sent to the bench. 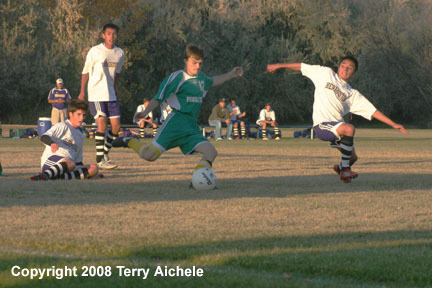 LEFT - A Hermiston midfielder brings the ball into the Bucks zone. RIGHT - It's a tangle of bodies in front of the Hermiston goal as Pendleton takes a last second shot on goal good for the winner.